This topic contains 20 replies, has 3 voices, and was last updated by agepastadmin 3 days, 5 hours ago. WHY MY PLAYERS WON’T PLAY. I have similar problems in my usual group. Although they have not refused – still – to continue testing. It is also true that we are playing with the Simulation Based System-Optional Rules (for making the game more immersive). The issue of the dice pool … I partially agree. On the one side is the problem of redundancy between levels of Hindrance and the number of success required, because they suppose a double level of increase the difficulty in the skill rolls. If you want to make something more difficult for PCs you can ask for a higher number of success, but you can also increase them in one Hindrance. There are two methods in the system that do the same thing: increase or reduce the difficulty of a roll. My interpretation/solution to this is that the GameMaster decides the number of successes to obtain according to the difficulty that he/she considers (eg: require 2 successes to find some incriminating documentation of a traitor RDF (or UEDF) officer hidden in his office) and apply Hindrances or Edges depending on external difficulties to the action (for the example, one Hindrance because there are same Tactical Pods out of the building currently shooting at the building which PCs are inside looking for the documentation). Why apply a Hindrance instead of simply increasing the number of successes required to 3 – for example-?… Well … That’s why I say it’s a redundant system. 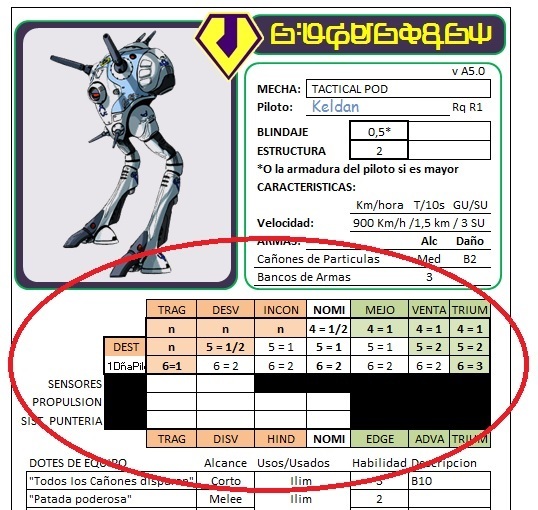 It would be more simple increasing or reducing the number of successes required for the print run, but -as the “Hindrance system”- so associated with the Mecha stats, Talents, Elements and other rules I think remove it would be a nightmare. Also. honestly, I don’t dislike either. And in fact in combat I see it quite original and the Hindrances / Edges system so integrated in itself that I do not see it change it. Is the Mod Skill (hindrance system) aplication complex? … Right!. But as already indicated that system particularly I find original and I like it. And the way to do it simpler (since more intuitive can not be done) is to provide players with quick access to the table. In our case in the sheets of Mechas. In this way, after the roll, with a quick look the players can see the successes achieved and -for the moment- is resulting in my group. And the other side, the mechanics of dice pools is nothing new. Although the fact that the same skill serves to do anything (well: it is not new for those who have played FATE Accelerated and use their “Styles”) with the skill synergies leads to abuses and limitations in the roleplaying (“only 1 level in “I can Fix” to repair your systems?.. ¡No problem!. Do it quickly! (Flash Move – level 4) and you will always be sure to roll a minimum of 5 dice; are your PC handcuffed and you are hard to free yourself (Escape Artist – level 1)? Do it fast, and make sure you roll 5 dice!…”). Which means that many players end up losing the sense to invest in one skill over another (“New skills?. that’s wasting my time and my Build Points!. Increase your useful Skill!!”). This problem led me many times to penalize same of the rolls splitting them. The Swarm system also seems innovative and fun. But (today is the day of the “buts”! ), it drive to paradoxical situations: “5 enemy Pods? (= Swarm)… Dont worry: they have only 1 die each!! ; 3 enemy Pods?… Oh no! We have a problem!!”. Despite this I like the approach, because it allows you to faithfully recreate things that can be seen in the show: “today you destroy enemies for tens. Tomorrow you can have a difficult “duel” with a single Tactical Pod. This is great… And fun!. May be fun for you, but was majorly annoying for us. It’s not that it’s dice pools – the kids all enjoyed L5R 5, WEG Star Wars, and Tunnels and Trolls… and some of them enjoyed Mouse Guard (the others haven’t tried it). It’s the constant having to think about what value a die is worth. And each die having many possible configurations of different result values. And it’s a preference issue that won’t change with more experience – it was that it was becoming MORE annoying with experience, not less, that made for refusal to continue. Oh, and the many combinations? 3 each on 3 independent scales – because the way it’s written, the changes from 4’s only cancel each other. The changes from 5’s only cancel each other, and likewise 6’s. It’s possible to have 4’s be high, 5’s low, and 6’s normal… or 4’s high and 5’s and 6’s low. It’s thus a 9 space not a 7 space that you imply with your on-sheet graphics. This reply was modified 4 months, 1 week ago by Aramis. 3 each on 3 independent scales – because the way it’s written, the changes from 4’s only cancel each other. The changes from 5’s only cancel each other, and likewise 6’s. It’s possible to have 4’s be high, 5’s low, and 6’s normal… or 4’s high and 5’s and 6’s low. …Wait a minute!. That’s right?. If I’m understanding you well… Each die result can be affected by different Skill Mods in the same roll?. in v0.4. yep. V0.5, too. It’s worked really well in my SuperAge RPG which i now published and I have run at Gen Con for years, this sliding success scale and simultaneous initiative, worked really well for that game. We biased the successes upward. Another issue we’ve had during testing is copious amounts of successes. Like people getting 9-13+ successes… which kinda took things out of scale. We are about to run another set of internal tests and external seems to be going well. Once we get that we can adjust again.